Posted on Thu, Feb 9, 2012 : 11:50 a.m.
Gov. Rick Snyder today proposed a $48.2 billion budget for 2012-13, including increases in funding for public schools, universities, public safety, arts and culture, rainy-day funds and economic development. Lansing lawmakers and lobbyists will jockey for dollars after Gov. Rick Snyder issued his today proposed 2012-13 budget. Thu, Feb 16, 2012 : 6:10 p.m.
Yeah buddy: The economy was turning towards the end of Granholm's administration. Snyder has helped the recovery along. Fri, Feb 10, 2012 : 10:47 p.m.
Mon, Feb 13, 2012 : 6:35 p.m.
Higher education increase?HMMMM todays paper EMU 12.4 Graduation RATE ?? ?/ CUT in foodstamps/Snap by Snyder 3 Times in 6 months. THE raise in SS checks gives Senior&quot; Excess Income.&quot; I wunder what he is living 'ON&quot;! The road and bridge budget under Engler was $ 1,5 billion SO WHERE IS THE WORK? and By Whom has it been Done. No work around my City/Twonship! No business pays taxes. All taxes that business pay are reflected in the cost of the product or service they sell. Economics 100 covers this fact. Unfortunetly, we do not teach economics in school any more, and we have a political party that uses class evvy to support the incorrect idea that government services are free. Our choice is do we want an economy like Greece or Germany? When did parnets quit teaching their children, &quot;Nothing in life is free&quot;? Fri, Feb 10, 2012 : 1:55 p.m.
Like all good politicians, RINO Gov. Snyder panders to those that yell the most. Higher education has made no attempt to reduce costs, but higher ed knows if they complain loudly enough, the public will support them. Instead of spending the surpluss on better roads, we will give more $ to education, and ask for higher taxes to fix the roads. Except that's wrong ...tuition had been held to the Governors line as he required, and their budgets were still cut 15%! Higher education funding in Michigan is now in the lower 20% of States across the Country --- 80% of States value higher education more than Snyder does. And yet, UM is an internationally recognized research university! All this so that $1.8 billion dollars could be redistributed from the poor and middle classes to businesses. Fri, Feb 10, 2012 : 11:40 a.m.
And of course, I forget to mention that the increase in taxes have not been paid yet, so where do the extra funds come from. Fri, Feb 10, 2012 : 11:57 a.m.
Carole, all these extra funds are what he loop-holed out of the School Aid Fund. He took it from the schools. Fri, Feb 10, 2012 : 11:39 a.m.
Well, I guess with all of the increases in taxes, there should be a balance. What I am still wondering about though is that the budget was in a deficient, many taxes raised, cuts made, then all of a sudden there were funds above and beyond. Then, of course, the officials immediately wanted to spend the extra funds. Maybe it is just me. What I truly am hoping for though is a fiscally responsible government. Fri, Feb 10, 2012 : 2:21 a.m. Create a crisis by reducing funding. Now be a hero and come to the rescue with money to save the day. Is anyone else tired of this political whipsaw? Our CEO governor is really just another politician. Surprise! Mon, Feb 13, 2012 : 6:29 p.m.
No He isnot a politician ....Polutician Know how to please the citizen and have a few more years in Office...HE is a peanut counter etc etc..
Fri, Feb 10, 2012 : 1:13 a.m.
Let them eat cake! Oh Snyder, thank you! No, really! The K-12 programs should now be all set to provide stellar educations to ALL the kids in Michigan, what with that generous fraction of a percent you're giving back, after taking so much. This changes everything. Really. Fri, Feb 10, 2012 : 1:56 a.m.
Donbee, your numbers are completely inaccurate and misleading, as usual. I lack the time or energy to post links to accurate representations of what Snyder cut, on top of massive prior cuts and declining enrollment due to all this charter nonsense. Not that it would ever make any difference to you. Fri, Feb 10, 2012 : 1:32 a.m. The reduction last year was 2 percent - the increase this year is 0.8 percent. Both are such huge numbers! Thu, Feb 9, 2012 : 10:43 p.m.
Sparty - I love your mythology, you should write a book. It is a hoot. 300,000 small businesses each got an average of $1,800 in reduced taxes by moving from double taxation (corporate and then personal) to single taxation. While Ford, GM, Meijer and other larger corporations pay more. Many loopholes in the laws for corporations were closed over a 3 year period, meaning more money would come from corporations as those loopholes expire. Biowheels - Your mythology is a hoot too! The majority of truly senior citizens (those over 65) see no additional taxation. The new taxes fall mostly on people under the age of 65 who have retired. The various pension funds pay Michigan residents under 65 a total of more than $7,500,000.00 a year in pensions. Why should that money not be taxed? 401K's are, why should pensions be different? Should the retirement playing field not be level? Fri, Feb 10, 2012 : 11:27 a.m.
Wrong is wrong, no matter how you spin it. Taking money from retirees, on a fixed income, who retired anticipating having that fixed income, is WRONG. This move, especially if it achieves so little for the state budget, as you say, was ill-advised &amp; unethical. Doing so to the benefit of business having a &quot;fair&quot; tax is illogical: Take Grampy &amp; Grammy's pension so business will have a &quot;fair&quot; tax? WRONG again . . .
Fri, Feb 10, 2012 : 3:04 a.m. So here we go with majorities again on pensions, huh? If they are retired they are a &quot;senior citizen&quot; in most peoples eyes and in general live on a limited income. I doubt they earn $7.5 million a year as you so incorrectly state. And call my numbers mythology if you like, but the fact is the Gov redistributed $1.8 billion dollars from the poor and middle class to businesses. That's a fact. Your mythology is a fantasy. Thu, Feb 9, 2012 : 10:21 p.m. Instead of spending more of the public's money, which most Republicans like Snyder like to do, why not give back the money he has taken from the retired senior citizens in this state that are taxed beyond their ability! By increasing state taxes to seniors last month on their &quot;retirement pension&quot; the Governor has shown his real colors - tax the poor and give money to big corporations! No surprise, since he is in the corporate pocket. Time for a change in leadership that cares what happens to the senior citizens of this state. Thu, Feb 9, 2012 : 8:28 p.m.
Get serious, he wouldn't have funds to give if it wasn't for the auto bailout. Let's see... who supported that initiative? 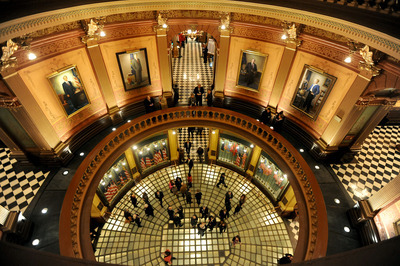 Thu, Feb 9, 2012 : 8:17 p.m.
19% approval rating show's Snyder is really connecting with Michigan constituents. If the recall attempt starting in May fails, there is only 2 short years until an election takes place. In the interim, in November the entire House of Representatives is up for election. Perhaps the pendulum will swing and put a major brake on the republican's draconian cuts to the poor and middle class, in favor of the $1.8 billion giveaway to businesses. Fri, Feb 10, 2012 : 7:43 p.m.
Fri, Feb 10, 2012 : 3:07 a.m. The &quot;latest poll I've seen&quot; is a sample of less than 1000 folks, directed by a pollster with a track record of supporting big government even before Synder was elected. Translation: latest poll Sparty &quot;sees&quot; is what he wants to, brings up constantly, and clings to like a tired old blanket. Fri, Feb 10, 2012 : 2:57 a.m. But perhaps the second, third, or fourth attempts will succeed. We will see. The latest poll I've seen shows a 19% appoval rating, I'm sure there are other polls. Are you suggesting between 25-35% is something to be proud of? I'd think he'd be cared of recall attempt #2! Thu, Feb 9, 2012 : 10:35 p.m.
Bring back Granholm......she did things right! You're going to have to give up that tired old mantra and quote honest numbers: "While Gov. Snyder's job performance numbers remain low – at only 35 percent high versus a 25 percent low – his numbers have improved from June 2011 – a notable uptick, when his high was only 28 percent and his low was 30 percent," said Jeff Lambert, president and managing partner of LE&amp;A. "Our poll found that the governor's agenda is picking up momentum and starting to positively resonate with Michigan residents." Thu, Feb 9, 2012 : 6:50 p.m.
After all of the recall noise and the derision of Rick Snyder, it sure looks like he has things moving in the right direction. Yes, the new direction will be a new governor! Thanks for your support. Thu, Feb 9, 2012 : 6:11 p.m.
Don't worry, as soon as a Democrat takes over they will throw us back into the deficits that we all know and love. Fri, Feb 10, 2012 : 3:45 a.m.
What deficits? The state budget has to be balanced by law. Thu, Feb 9, 2012 : 5:42 p.m.
Kind of quiet out there...where are all of the attackers? Fri, Feb 10, 2012 : 12:42 p.m. The senior citizens who are from the generation who got us into this mess? The seniors, the majority of whom live on a gravy train of pensions + social security + employer-funded health care and complain about cuts (never mind that they left the next generation with none of these?) The senior citizens who helped to build a corporate world that cares only about profits (but made sure their pensions weren't cut, only the next generation?) The senior citizens who who's parents built a vast infrastructure but didn't care enough to maintain it for the next generation? Let 'em pay. Thu, Feb 9, 2012 : 11:44 p.m.
BioWheels: What I say about that is that I value that information as much as any secondhand information told anonymously on the Internet. Thu, Feb 9, 2012 : 10:23 p.m. Check out the senior citizens that now pay beyond their &quot;fair share&quot;! Where are all of the supporters! With a 19% approval rating, I'm not surprised! Kind of quite out there for the former Snyder supporters. Yesterday I overheard a man in a restaurant say &quot;If I'd know Synder was going to tax us to death, I would never have voted for him. I wish now I hadn't&quot;. What do you say about that? I can't hear you? Thu, Feb 9, 2012 : 10:13 p.m. I was wondering the same thing. I'm are someone will find something to say though.